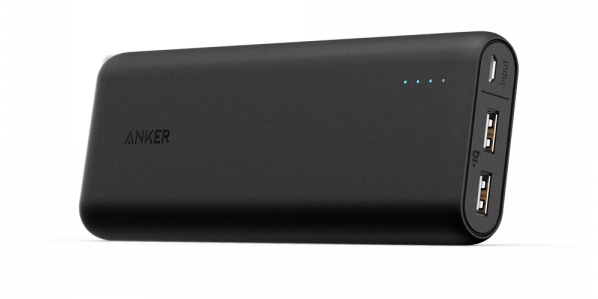 This is my second Anker external battery pack, having previously purchased a 12800mAh Astro 3 about 18 months ago. It has seen a lot of use since then (in the car, whilst camping, business trips etc), so when Anker offered me this new Astro E5 to review I jumped at the chance. This has even more capacity than my previous battery pack, which in itself was pretty capacious. When I got it, I let it charge up overnight and then took it to work and told all my colleagues in the office to use it if their phones needed a charge during the day. It’s now four days later, and six of us have topped up the charge on our smartphones (Android and iOS) several times and the Astro 3 still isn’t empty! Anker’s claim that it can fully charge a typical smartphone from empty six times seems perfectly believable on this evidence. There have been some minor but pleasing improvements on the packaging front too. The box now looks a lot more classy, whilst retaining the all-cardboard construction that’s both easy to open and easy to recycle. I like the new mesh carry bag that the Astro comes with too. It seems a bit more robust and practical than the cloth one that I got with my earlier battery. The four LEDs on the case are a good indicator of how much charge remains in the pack, and I like it better than the “dial” lights that previous incarnations have used. Also, these lights don’t accidentally switch on every time you touch the battery pack which they do on my other version. Downsides? There’s only two USB outputs (my other unit has three) and the plastic finish isn’t quite as nice in the hand as the rubberised one on the Astro 3, but these are very minor nitpicks. All in all, this is a really nice unit. Rock solid build, compact size and really massive capacity. Impressive. This entry was posted in Mobile and tagged Anker, Astro, battery. Bookmark the permalink.